With the Leafs still not quite set at that fourth line center spot – rookie Par Lindholm appears to be an early contender for the position, it wouldn’t be surprising to see the Red Wings circle back to see if new Toronto GM Kyle Dubas would be willing to offer a bit more now. Red Wings GM Ken Holland has acknowledged that they may need to clear a little bit of payroll off their books and moving Glendening – who has three years left with an AAV of $1.8MM – should allow them to get under the Upper Limit regardless of Henrik Zetterberg’s situation while filling a need on Toronto as well. After being active near the trade deadline last season, NBC Sports’ Adam Gretz suggests that the Rangers may be a team to watch for on the trade front again in 2018-19. New York has a pair of notable forwards that are slated to be unrestricted next summer in winger Mats Zuccarello and center Kevin Hayes and with the team firmly committed to a rebuild, those two could very well be on the move in the coming months. Maple Leafs winger William Nylander remains unsigned and is the most prominent restricted free agent remaining on the market. In an appearance on the Steve Dangle podcast (video link), Sportsnet’s Chris Johnston suggested that it may still be a few more weeks before a deal gets done. He viewed the opening of training camp (September 13th) as an artificial deadline to get something done and that it’s certainly possible that it could go a day or two beyond that as well. Nylander’s case has been well documented already and it will be interesting to see if Toronto can reach a long-term agreement or if they opt for a bridge deal to keep his cap hit down in the short-term. The Boston Bruins continue to get healthier as NBC Sports’ Joe Haggerty reports that Rick Nash could play as early as Sunday, although the team may also wait for their first playoff game next week. Nash has missed 10 straight games with what was listed as a upper-body injury. However, Nash confirmed to Haggerty that he has been dealing with a concussion and is starting to feel better. The 33-year-old was a key trade deadline acquisition for Boston, but has only appeared in 11 games so far for the Bruins. He has three goals and three assists in that span and has a total of 21 goals this season between the Bruins and New York Rangers. The Bruins also announced that Riley Nash is out for the weekend. The Bruins forward took a puck to the head last week and required 40 stitches inside and outside of his ear to repair the damage. He has missed three straight games while having a breakout season. The 28-year-old has 15 goals and 26 assists this year, both career highs. No word if he will be available for the playoffs next week. 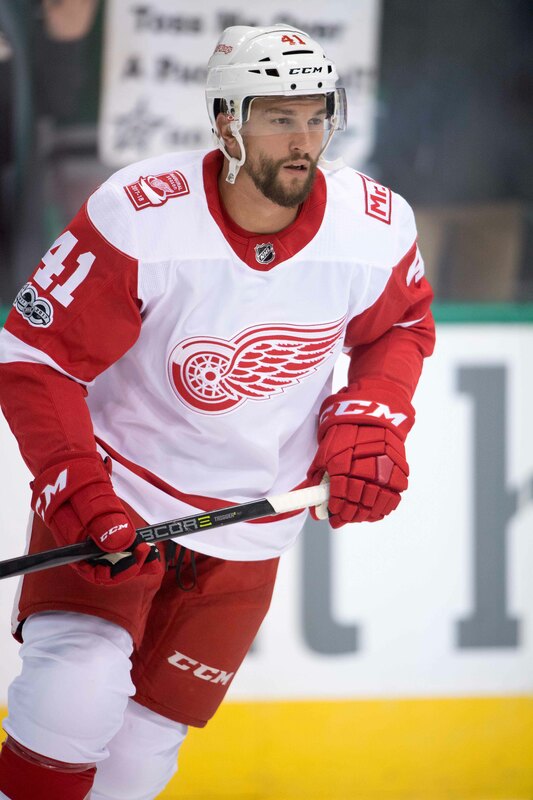 MLive’s Ansar Khan reports that although Detroit Red Wings forward Luke Glendening was originally believed to be out for the season, the forward will be active for tonight’s season finale. Out with an upper-body injury, he missed one game after being forced to leave Tuesday’s game against Columbus during the second period. Fox Sports’ Jon Rosen reports that Los Angeles Kings defenseman Jake Muzzin is skating, although he will not play in tonight’s regular season finale. The 29-year-old blueliner has missed four games with an upper-body injury. Rosen adds that head coach John Stevens wouldn’t say for sure whether Muzzin would be ready to play for the first game of the playoffs next week. Tom Gulitti of NHL.com tweets that forward Marcus Johansson is close to being ready to return to the ice, but still isn’t 100 percent. The 27-year-old winger has not played since Jan. 23 with a concussion, but could be ready for the playoffs next week if all goes well. After a 24-goal season a year ago with the Washington Capitals, Johansson has managed to appear in just 29 games this year, putting up just five goals. A healthy Johansson could be a big boost to the Devils. The Vegas Golden Knights announced that center Reilly Smith will be a game-time decision for tonight’s game against the Calgary Flames. Smith, who has been out with an upper-body injury has missed 15 straight games. If he plays, the team’s first-line center might just be looking to get some work in before the playoffs start. Arizona Coyotes’ Dave Vest reports that forward Christian Dvorak, who has missed the last three games with a lower-body injury, will not play in tonight’s regular-season finale. He finishes his season with 15 goals and 37 points.